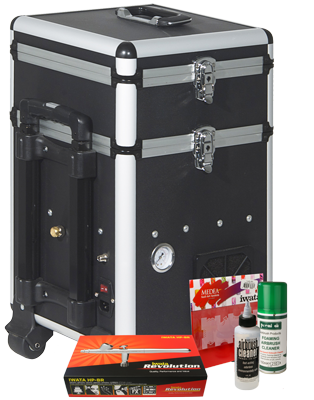 Housed in a portable and sturdy case with a 2.5 litre air tank and a built in storage unit for all your airbrushes, beauty products and accessories, the Maxx Jet really allows you to take your nail art on the road. The Maxx Jet compressor is also suitable for running an airbrush for other beauty applications, such as tanning, body art or cosmetics. Please click here to see all other nail art kits.